Three bats in two caves in Missouri’s Lincoln County have tested positive for white-nose syndrome. A little brown bat from one cave and two tri-colored bats from another, both public caves north of St. Louis, have been confirmed by the U. S. Geological Survey National Wildlife Health Center in Madison, Wisconsin. Evidence of WNS was first detected in Missouri in April 2010 on a little brown bat found in a privately owned cave in Pike County. It was then detected again a few months later in May 2010 on five federally endangered gray bats and on a northern long-eared bat netted outside a public cave in Shannon County. 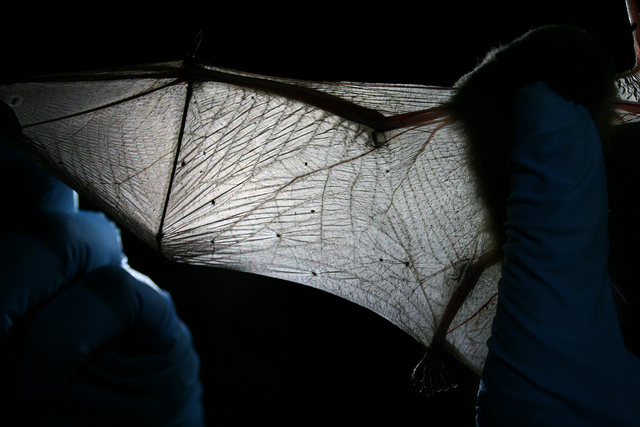 In these earlier cases the bats had contact with Geomyces destructans, the fungus that causes WNS, and may or may not have been infected with the disease. That makes these three bats Lincoln County bats are the first confirmed cases of the disease in Missouri. Now that WNS is confirmed as present in Missouri, it’s likely to spread. The Missouri Department of Conservation has been working with the Department of Natural Resources, Ozark National Scenic Riverways, the U.S. Forest Service, the U.S. Fish and Wildlife Service, conservation groups and private cave owners to address the threat of WNS. Some of their efforts include restricting access to most of the publicly owned caves that contain bats and educating the public about the value of bats and the threat of WNS. About ¾ of the more than 6,300 caves in Missouri are privately owned. Visitors to private caves are asked to check with landowners before entering caves, and to use USFWS decontamination protocols before and after visits to reduce the risk for accidental spread of the fungus.